It really is hard to not love Fall… The warm colors, apple picking, and pumpkin spice everything. Although it is my favorite season and I love almost everything about it, styling hair can be quite the challenge as temperatures begin to drop. Who am I kidding? We skipped the Fall weather and went straight to Winter, yet again. While you might not have to worry about your hair frizzing from humidity, it can be a bit hard rocking a cute hairstyle while wearing a knit headband or hat. Whether you’re going apple picking or just running some errands, try out these super simple Fall hairstyles that still allow you to rock the trendy Fall hair accessories to stay warm and cozy while still looking chic and stylish. It’s the perfect, timeless, and oh so classic ponytail… With a twist! Tie a small layer of hair and twist the ponytail inwards and pull the tail down from the inside, then tie that ponytail with another layer and twist again. Perfect if you’re going for a modern-day Rapunzel-esque look! Simply tie your hair into a low ponytail (or wherever you desire) and using thin elastic hair bands, start tying the ponytail off in sections so that each part is even. Then gently pull the hair in each section to loosen it up, making it into a rounded, more volumized bubble. Another timeless and chic style, with a little twist on the classic ballerina bun. 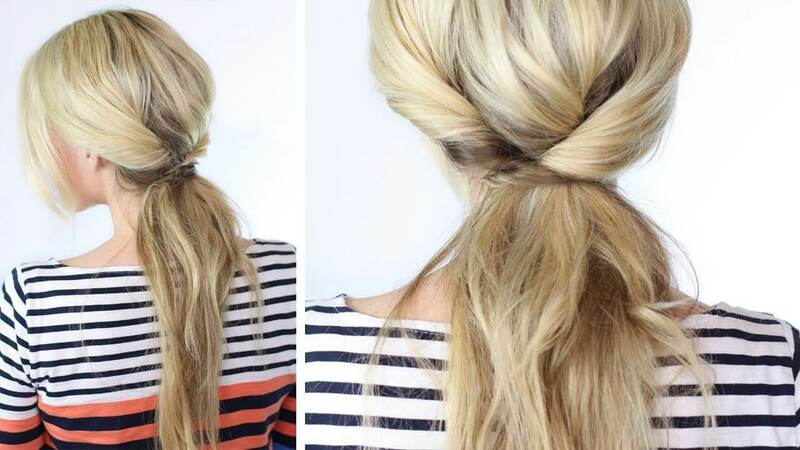 Tie your hair into a high ponytail. Pull out a small section of your ponytail and braid it, then let it rest while you wrap the rest of your hair into a bun and secure it with a hair tie. Then take the braid and wrap it around the bun and secure it in place with a pin. If you want a smaller, tighter bun, take the entire ponytail and put it into one large braid. Then wrap it around into a bun and secure it in place with a small hair tie.